Purchased by the New York State Library, October 4, 1941 from William P. White of Clinton, N.Y. with money from the Gotshall Fund. See provenance note for further information. Elizabeth Shaver, Volunteer, May 1991; revised by Vicki Weiss, August 2006. Rufus A. Grider, from the title page of volume IV, First Commercial Highways of the State of New York. Rufus Alexander Grider was born April 13, 1817, in Lititz, Lancaster County, Pennsylvania, a town founded by members of the Moravian Congregation in 1756. Grider's ancestors came from Switzerland and Grider was confirmed in the Moravian Church. He graduated from John Beck's School for Boys in Lititz. Grider married Elizabeth Skirving of Germantown, Pennsylvania, October 20, 1863 (or October 13, 1864); they had two daughters: Amy (born ca. 1865), who married James H. Sammons of Canajoharie, and Margaret (Margaretta S., born ca. 1868). Elizabeth Grider died March 12, 1875. Census records show the Griders lived in Bethlehem, Pennsylvania from 1870 to 1883, when he moved to Canajoharie, Montgomery County, New York. He taught art at the Canajoharie Academy (replaced on the site in 1892 by the West Hill School) until his retirement in 1898. Rufus Grider died February 7, 1900. He was survived by a brother, Lawrence, of Cadiz, Ohio, and a sister, Mrs. Adeline Fett, of Lititz. The Rufus Alexander Grider albums of his pen-and-ink sketches and watercolors were acquired by the New York State Library in October 1941 by special funds made available through the bequest of the late William Charles Gotshall. Before coming to this repository most written accounts indicate that upon Grider's death in 1900, his albums "fell into the hands" of an Albany (N.Y.) dealer in rare books who sold them to W. Pierrepont White of Utica, New York. On the latter's death, his wife and sons offered them to the State Library. 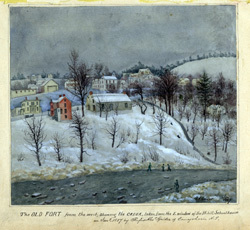 "The OLD FORT from the west, showing the CREEK, taken from the E. window of the W.hill Schoolhouse, in Jany. 1887 by Rufus Alexr. Grider of Canajoharie, N.Y."
Rufus A. Grider's artistic endeavors of places and objects related to New York State history began in August 1886, while sketching the buildings erected by Sir William Johnson at Johnstown, Fulton County, New York; this is when he said that he first came up with the idea of making a "collection of pictures of old and new & curious objects possessed by inhabitants" of the Mohawk Valley. He decided he could also draw objects that "formerly existed" if he could find individuals who could "describe the objects & recognise [sic] them when drawn or restored to view." Initially he drew views of buildings and landscapes, then Indian relics and finally "any object suited for illustration," including documents, which he "copied by tracing, making a coplete [sic] duplicate of the original". 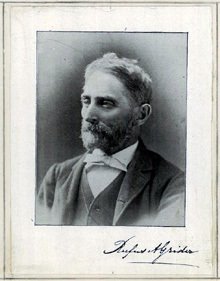 From 1886 to about 1900, whenever his "school duties allowed," Grider traveled up and down the Mohawk Valley, with occasional excursions to the Cherry and Schoharie valleys and Lake George and Lake Champlain, in search of historic buildings, battlefields, the sites of ancient forts, the relics of Indians and early settlers, all of which he drew or copied and then arranged – with explanatory notes – on pages of albums. In the October 1, 1888 preface to Volume I, Grider states the object of his work was twofold: "to preserve the memory of very many interesting objects of this locality – which might otherwise be lost – and 2d, for the pleasure such researches gave me, the greater the difficulty of solving a mystery, the greater the interest". By the time of Grider's death in 1900, he had compiled nine volumes containing 1,041 pieces, including 623 water color sketches, 42 water color portraits, 169 tracings of manuscripts, 81 original engravings, seven original manuscripts, 71 tracings of maps and plans, 23 photographs and 25 water color drawings of powder horns. The first five volumes are devoted primarily to the history of the Mohawk Valley region of New Yew York State. The first three include a potpourri of images that include historic buildings and structures, natural features, early family records and historical documents, and Indian artifacts; the fourth devoted to the first commercial highways of the state, including the rivers, canals and turnpikes, and the fifth, with text as well as pictures, telling the story of the invasion of the Mohawk and the Schoharie valleys by Sir John Johnson and his Indians and Tories in 1780. Volume six contains material on Fort Ticonderoga, Lake Champlain, Lake George and other parts of the state, while volume seven is devoted entirely to the Cherry Valley, and volume eight, to the Schoharie Valley. The ninth volume contains text and illustrations devoted to the Continental Road built by General Sullivan's army between the Mohawk River and Otsego Lake in 1779 during the expedition that destroyed the settlements and crops Iroquois Indians in central and western New York. Volume I: A Collection of Illustrations of Historic Matter Consisting of Tracings of Documents, and Pictures of Curios, &. &. Collected Principally in the Mohawk Valley, A.D. 1886 & 1887 by Rufus Alex'r Grider, of Canajoharie, N.Y.
[Volume II]: A Collection of Historic Matter Relating Principally to the Mohawk Valley, Being the Second of a Series Made by Rufus A. Grider of Canajoharie, Montgomery Co., N.Y., 1889. [Volume III]: A Collection of Illustrations of Historic Matter Consisting of Tracings of Documents, of Pictures, of Restorations, Curios, Portraits, & &. Relating to the Mohawk Valley, Gathered Mostly During the Years 1889 to 1897. It Is Not a History, But Consists of Material Suitable for Illustration and Which, It Was Thought, Should Be Preserved. This Volume Is the Third of the Mohawk Series, Soon to Be Followed by a Fourth – Illustrating the Great Invasion in the Years 1780 by Sir John Johnson. Collected & Drawn by Rufus A. Grider of Canajoharie, N.Y. [Dated]: March 10th, 1897. [Volume IV]: First Commercial Highways of the State of New York by Rufus A. Grider..
[Volume VII]: A Collection of Historic Matter Relating Mostly to Cherry Valley, Otsego County, N.Y. Made in the Year 1888 Being the Fourth of a Series Made by Rufus A. Grider of Canajoharie, Montgomery Co., New York. There is a discrepancy as to whether this is Volume IV or Volume VII. The date and the reference "fourth in a series" seems to indicate this volume should be Volume IV. However, provenance suggests the volume became Volume VII. An article by R.W.G. Vail on the items in Volume VIII appeared in the Quarterly Bulletin published by the Schoharie County Historical Society in January 1944 (pages 6-16). The article was basically the same as the one that originally had been published in the 125th Annual Report of the New York State Library. The article prefaced descriptions of the images in Volume VIII that are more detailed than the item-number descriptions provided in this finding aid. A copy of the article is appended to the paper copy of the finding aid available in the reading room of the Manuscripts and Special Collections unit of the New York State Library. Prefatory information in volumes II and IV refer to "a collection of over 100 colored pictures of powder horns ... with notes relating where & by whom used in war time & views of the places where made or used. This latter collection seems to be the only one known to exist & has excited the attention of many antiquarians as an entirely new idea. Should these books be separated, the foregoing explains how they follow & that each vol. is complete in itself." A penciled note signed R.W.B. Vail on the preface for Volume II states: "The powder horn collection is now in New York Historical Society and a partial duplicate (?) collection in Worcester (Mass.) Historical Society". Several of the nine volumes have hand-lettered indexes. The item list compiled by the New York State Library for the collection was an embellishment of the original indexes.